I am so thankful today that I am visiting Son #2 and family. I enjoy playing with and visiting with the children. Em and her dad just left on a bicycle ride. Soph is playing house in Little One's playpen turned on its side and Little One is bound and determined to climb the stairs once more today. They keep me hopping, but they are, oh, so much fun! Little One has really grown and matured since we saw her last. Soph is a very grown up young lady now with gorgeous eyelashes, and Em is very busy with her own activities which include rolling around in her new Heelys (shoes with wheels in the heels) and playing football with the boys in her class. See Kara's blog entry on Emma's birthday yesterday--we came to be a part of the birthday festivities this week, but we get the added bonus of visiting with the whole family, and Kara and I had a wonderful shopping trip together today!! We saved so much moneyby visiting many of the sales in town! I am thankful for my family, all the things I have, and all of my friends. I am thankful that Arrie is born. It felt like spring today. In fact, it really felt like summer all of a sudden! They said we set a new record high for this date with 92 about the middle of the afternoon. I did some yard work, cleaned leaves out of my pond, and trimmed up our banana trees that had not frozen back all the way this past winter. The fronds from last summer were nipped by the few freezes that we had. However, big, new green fronds are poking up out of the tops of the banana trees already. And I took a couple of pictures of the potato vines that bloom all winter. I really enjoy looking out on a cold day and seeing the brave little flowers blooming their heads off. Tomorrow is supposed to be about 30 degrees cooler than today. Our touch of summer was short-lived. However, it really put me in the mood to do some digging in the yard. I am thinking about doing an herb garden in big pots around my pond this year. We have so many trees in our yard that sunlight is a problem for growing many plants. Maybe the container herb garden will work this summer. After reading Kara's description of the fragrance of basil, I can hardly wait to plant some for us! I am thinking about planting basil, thyme, lavender, and I already have some rosemary started to add to the pots. Umm! Fragrance! 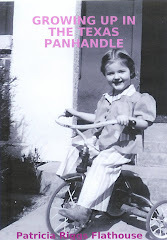 I grew up in the small Texas Panhandle town of Pampa in the 1940s and 1950s. Pampa was a thriving oil town with a carbon black plant, and refineries that belched black smoke and malodorous stuff into the air which combined with the stench of the open oil and gas wells. I often wonder about the health hazards of growing up in such a foul environment but all of our family seems healthy enough. After all, Daddy lived to be 93 and Mother is still alive at 92. Summers were hot and dry most of the time, and winters were cold and often snowy. It seems that the wind blew year around…hot and dry in the summer, and cold and frigid in the winter. We had no air conditioning, but Daddy put a swamp cooler in the dining room window the last few years we lived in Pampa. The heat in our house came from the oven in the kitchen, a gas stove in our living room false fireplace, a floor furnace in the middle of the house, and an open gas stove in the bathroom. I think we all burned our feet on the floor furnace as we were learning to walk, but it was great to stand over that furnace to warm up on a cold winter’s day. Daddy was a traveling salesman for a wholesale hardware company and was gone most of the week “working his territory.” On Fridays and Saturdays he sold hardware products to the stores in and around Pampa and sometimes let me accompany him on those days. I had a wonderful time visiting in the hardware stores and wandering around lumberyards. To this day, the smell of wood can transport me straight back to a Saturday afternoon in a Higginbotham-Bartlett Lumberyard with Daddy leaning on the counter chatting with the men working there and writing down their orders in his order book with everything in triplicate! Mother made most of our clothes and was a wonderful cook. She read to us, played games with us, and also did needlework, and many arts and crafts. All three of us children grew up doing arts and crafts with her and learning crafts of our own. I remember beading, copper tooling, needlework, paint by number books, shell jewelry, copper enameling, leather tooling, and many, many other crafts. It seems like we tried them all at one time or another, thanks to Mother’s help and encouragement. Our lives in Pampa were busy and full, and I remember that as a very happy time in my life. I am thankful today that I am finally feeling just a tad bit better. This has been a rough week. I have been sidelined for four days with a stomach flu bug and hubby has had the real flu. We both have been lying around moaning and groaning. I am looking foreward to a nice weekend when we can get outside, sit in the sun and begin to recuperate. Meanwhile, I am also thankful for all of the nice people who have called and wished us well--plus, our wonderful neighbor who has brought us food and goodies to eat every day. The flu bugs have hit our household! My husband has the regular flu with watery eyes, fever, sneezing, aches, coughs--the whole works! And I have had the stomach flu--the whole works! No fun at our house right now. Yesterday we chose different beds and slept most of the day and today has not been too much better. However, the notable thing about this is the care and concern of our children and our neighbors. Two of our grandchildren and one of our sons are sharing their flu stories with us. The neighbors brought in enough food to feed an army, plus enough of their favorite remedies to get us back on our feet soon. I am sure the ole saying, "This too shall pass," will be a reality in a few days, but this is surely NO FUN right now! We just returned from a quick visit to son #4 and his family. We had a great time and I wanted to share some pictures. This first picture, on the right, is of Ella opening a Valentine present from Grandmommy. The next picture, on the left, is of Ella and her dad on their back patio on a warm February evening with just a few sprinkles. Ella is wearing her "Big Sister" shirt. This third picture, on the right, is one of Ella listening to her mother read one of the new books that Granddaddy bought for her at Hastings. Ella LOVES books! This next picture, above, is one of Ella sitting in a "big girl chair" at the restaurant for lunch. She sat there for the whole meal and was so good! 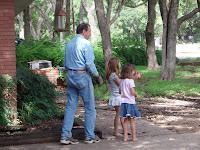 And this last picture, on the left, is one of Ella with her dad and granddad just before we had to leave and return home. The first thing I was thankful for today, Valentine's Day, was my brother, Joe. It is his ? ?th Birthday. I remembered back to the very snowy day in the Texas Panhandle when I was almost seven and Daddy came home to tell my sister and me that we had a new baby brother. In those days we didn't know the gender until the child made an appearance! I was so excited to have a brother who would not be interested in my dolls and girl toys--my sister was showing a healthy two-year-old interest in those things and I was often irritated with her! Joe was a good baby and we enjoyed having him around. Unfortunately, I left home for college by the time he was in junior high and I missed knowing him during those growing up years, but we have reconnected over the years and become the best of friends. We share similar interests in things like art and coin collecting and family matters. I am also grateful that my brother and sister support me in so many ways. In the past few years they have been great in helping me deal with Mother's affairs and they are both great to bounce things off of when I need advice or a soft shoulder to cry on (over the telephone!). Actually I am very thankful, too, for my Mother who was celebrating Valentine's Day at the Summit today with a full schedule of things going on. She was getting ready to go out for a noonday concert at a nearby church and then back for a Valentine's Day party this afternoon. She was supposed to get a haircut and perm today so I don't know when they will work that into her busy schedule, but she said she was "booked up" for the day--and seemed delighted to have so many things going on. Here is a picture that I took of her, all dolled up and ready to celebrate the day. I took her the balloon, someone else gave her a heart-shaped box of chocolates and Joe sent the pretty flowers in a lovely vase. I know she was enjoying all that attention! And the last, and MOST IMPORTANT thing I am thankful for today is my wonderful husband! He is so great with surprises. While I was out exercising and visiting Mother, he went out and bought beautiful red roses so that when I came home they were on the table with a card and a small box for a surprise! Later, he tells me, we have a "date" to go out and eat, so I need to get out my prettiest red sweater and be all "dolled up" and ready when dinner time rolls around! Connie tagged me for a book meme and I had to inquire as to the process. It has taken me a little while to get around to it, but here it goes. The instructions are as follows: Pick up the nearest book (of at least 123 pages). Open the book to page 123. Find the fifth sentence. Post the next three sentences. Tag five people. I just happened to have the book, Writing from the Heart: Tapping the Power of Your Inner Voice, beside me on my computer desk because I heard the author, Nancy Slonim Aronie, speak at our Story Circle Network conference weekend before last. She was a wonderful speaker and charmed us in her talk entitled, “We Are All Alchemists: How to Turn Your Sorrow into Gold.” She kept us laughing even when she was talking about difficult topics and easily moved from laughter to tears and back again. She was most inspiring. Here is the quote that I found on page 123: (she is talking about her writing workshops in this section of the book) "So in a group setting, the participants become the teachers for each other. 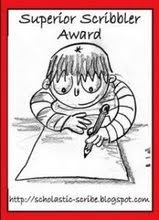 I have come to understand that writers need help undoing the red marks that scarred their tender creative tissue, tissue that developed a hardness, a callousness that keeps the writing cold and the reader out. But safety and unconditional love are the salves that soften those scars. As writers, you must learn how to translate your emotional experience onto paper." My sister and her daughter-in-law came to visit with the children this weekend. 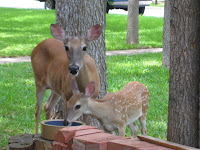 The children had fun helping my husband put out feed for the deer and playing in our back yard with Daisy. We did not actually see the deer at our house, but walked down the cul de sac and saw them in the woods. Today was a beautiful springlike day--just too pretty to stay inside! Our trees will be bursting into bloom soon if they can bloom without any moisture since we have not had any real measurable rain around here since last summer. We really enjoyed our visit and hated to put the children in the car for their ride home. Our life story, chapter by chapter, is the story of our adventures. Start by making a list of the ten most interesting or unusual adventures you have had. · What kind of adventure was it? When? Where? Who was involved? · What did you learn through your adventure? · What was your most exciting adventure? · What adventure held the greatest danger, physical or otherwise? · Have you had an adventure that changed your life? · Have you had an adventure that broke all the rules? · Have you had an adventure that was painful? · What adventure took you the farthest? · What adventure led to the greatest reward? Write about one or more of your adventures. Now that you have had a chance to think about your adventures, take a moment to consider adventures from another angle? · Are there adventures that you wish you had taken? Write about an adventure that you wish you had or had not taken. Labels: Adventure, Stories of Our Lives, Women writing. I am thankful for the wildlife that frequent our property, even though we live in a well populated part of town. Many people dislike the deer because they eat much of the vegitation--even that on the "deer will not eat" list. However, we love the deer who come to visit and we have named several who have such distinctive personalities. We call the boss lady of this herd Bossy Mama because she keeps everyone in line. You can see her with one of her little ones in the picture to the right. 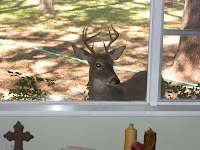 One of her little bucks entertained me last summer after I had surgery by coming to the bedroom window and looking in. We call him Bush Buck because he loves to get between the bushes and the house to gaze in the window. To the right is a fellow who has a marvelous rack of horns. I hope a hunter does not set his sights on our friend who came begging for food one afternoon last week. The grandchildren love to help their granddad feed and call the deer when they come to visit. And then we had an armadillo that dug into the soft, damp earth by our pond--under our banana trees. Our dog had been barking like crazy for several days and was digging up the whole flower bed. We could not figure out what was going on until my husband decided to see what she was digging for. 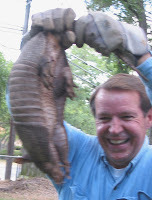 With a little help from Daisy, he came up with this very terrified armadillo which we quickly deposited in a neighbor's yard, safe from Daisy. 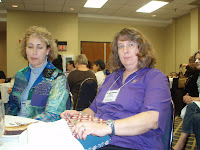 I am very happy to say that the Story Circle Network conference was just marvelous! This first picture is of our two wonderful conference chairwomen who did a great job of handling all the details involved in organizing a national conferece of this size! The second picture is of a presenter who introduced me to the idea of writing about cultural traditions and I was amazed at the variety of cultural traditions found in our group as we shared the things that we wrote. Our Blog Panel was very informative and I learned quite a bit from my fellow panelists and questions from the audience--on my way to being a better blogger! Other workshops I attended were quite enjoyable and informative--especially one that combined Yoga and Writing! attending--despite the early hour on Sunday morning. 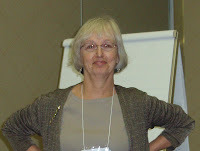 Here I am--bright eyed and bushy-tailed at the end of my presentation. Well, almost! I was sorry to see the conference end and to say good-bye to so many new friends!